Fall Festival is quickly approaching and preparations are already underway. Mark your calendars for this annual event in Harrington WA. Saturday September 22nd kicking off at 9am with the Harrington Fbla Fun Run. Followed by a rummage sale to help raise funds for the Harrington Opera House Society and the continuing renovations at the Historic Opera House. Both the Opera House and Hotel Lincoln, the Electric Hotel will be open for tours as well to show off the ongoing restoration work. The Harrington FFA is having a pancake feed starting at 10am in the Memorial Hall. Then the festivities move downtown at 11am for the parade which is organized by our Fire District #6. Next is the Harrington WA Lions Club BBQ, raffles, bingo and more in the city park. There will be various vendors including, food, arts & crafts, a snow cone machine ran by the Harrington FFA TrapShooting, kids games from the Harrington Nazarene Church as well as a beer garden put on by the Chamber of Commerce. The Studebaker Garage is throwing its first Pinewood Derby this year as well and that begins at 4pm. To round out the day will be the Harrington Alumni dinner at the school. Come on down to see what all the buzz is about. 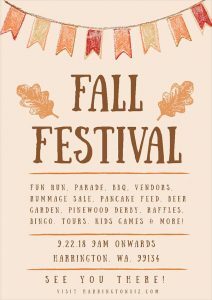 For more info, event forms and such please visit http://www.harringtonbiz.com/fall-festival/ as this page will be updated regularly.